With a smaller space, portraying too many messages can be confusing and largely ineffective. For a bigger impact it is important to clearly define your aims, which will then dictate the display stands, roller banners, posters and more that you will use to decorate your booth. Even if it is in a small space, if your visual identity is consistent and your marketing message is clear, then it will be received well by your peers. Although your floorplan may be tiny, you can still use the space above and across your exhibition stand to really make an impact. Use your imagination to think creatively in order to utilise the space that you do have, rather than focussing on your restrictions. 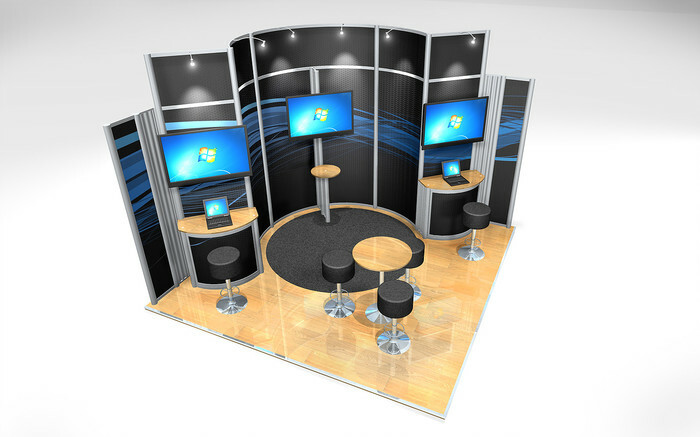 When limited on space, clever use of lighting can really make your booth stand out alongside its larger counterparts. Not only can it literally shine a light on your exhibition stand, it can also be used to highlight your graphics and to give an illusion of space! 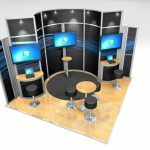 If you’re concerned that your exhibition stand won’t be able to catch the attention of trade show visitors, use social media to generate a buzz before the event even begins. Target the clients and companies that you feel could benefit from your product or service via networking sites such as LinkedIn and invite them to come and visit your booth. Doing this, you have a steady stream of relevant visitors that will actively come to find you at your stand. At PrintDesigns, we have been helping companies of all sizes to spread their marketing message loud and clear at tradeshows for over a decade. If you need advice or are looking for high quality banner stands, pop up banners or any other kinds of display stands, get in touch today! « Is your business personal enough?